Full Price: $ 52.95 57% off! 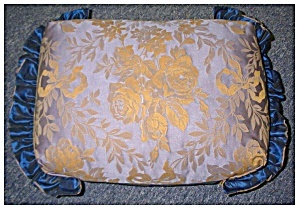 This georgeous vintage pillow is blue damask with double fabric gathered ends. It is 13 in. by 17 in. and with the gathered ends it is 21 in. long. The damask is on the front and the plain fabric on the reverse. It is in excellent condition.